Thomasson’s stocking program is designed to give customers the maximum flexibility possible to respond to day-to-day inventory demand. When a customer participates in the stocking program, a “staging area yard” is established in an agreed upon location and stock is maintained for the exclusive use of that customer. Our self-unloading boom trucks will deliver in the manner each customer directs. Thomasson’s performance goals are unvarying on-time delivery of poles which meet our rigorous quality standards, lead time of five working days or less, and formidable emergency delivery capabilities. In 1974, Thomasson Company pioneered the consignment distribution model that remains prevalent within the utility pole industry. The program is designed to provide you with the resources you need, when you need them, while minimizing inventory costs and eliminating costly labor hours due to delivery delays. The consignment program allows for utility poles owned by Thomasson Company to be inventoried and managed at customer-specified locations. 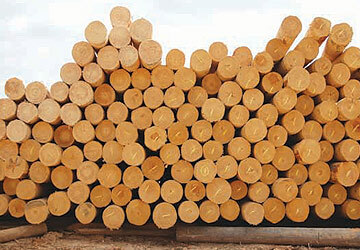 Ownership of the poles does not transfer to the customer until material is removed from inventory. Upon notification from the customer that inventory has been removed, billing is generated for poles used and an order placed for inventory replacement. The program is designed to work for both large and small customers based on your unique inventory demands. Annual pricing is available with long-term contract customers. Have a special project requiring a one-time-only shipment? We can help. Call us at 1-800-647-6260. Thomasson Company is proud to be a certified Women’s Business Enterprise. Granted by the Women’s Business Enterprise National Council (WBENC), this status acknowledges the integral roles CEO Pat Thomasson and Treasurer Helen Thomasson have within the company. Furthermore, WBENC certification affords companies who do business with Thomasson Company access to benefits and incentives from federal, state and local governments.